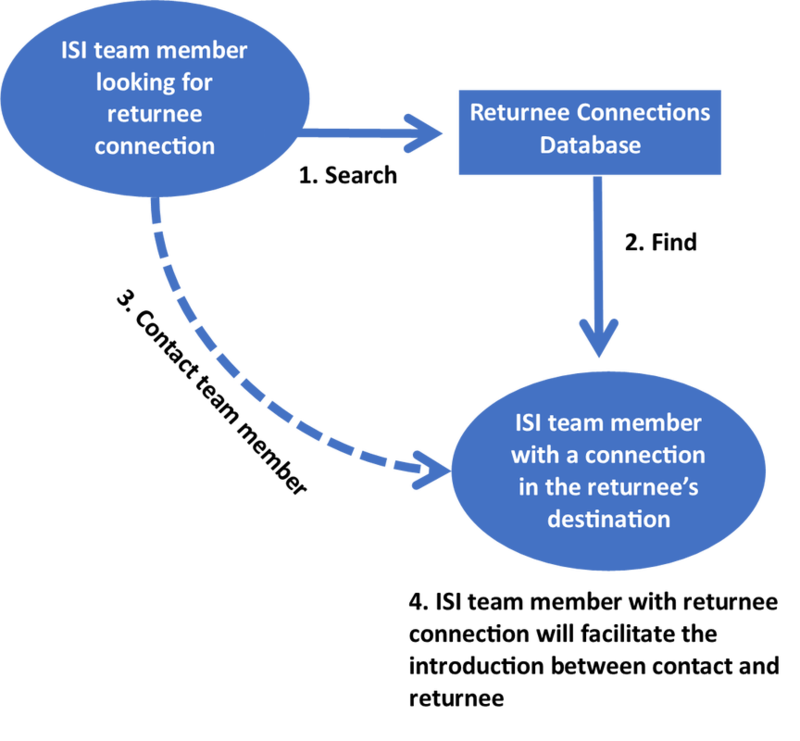 Welcome to the International Students, Inc. Returnee Connections Database. We serve international students from across the globe; however, our care for and service to them does not end when it comes time for them to return to their countries of origin or move on to other places in the world. To better serve our returnees, we are establishing a database of staff and volunteers who are able to connect returnees with individuals who willing to welcome and support students moving to their area. Please note that this is NOT a database of the actual in-country contacts. Rather, it is a database of ISI staff and volunteers who can introduce one of their contacts to the student moving to that area. The person requesting information will not be contacting the in-country contact, but will instead contact the person (in the database) who has already built a relationship with the in-country contact. That person will then reach out to his/her contact through their usual method of communication and introduce them to the student moving to their area. For the security of all concerned, no contact information for in-country contacts should be entered in this database, apart from the general location of the contact. Also, please do not share this site with anyone outside the ISI team or link it to any other site. *Please note that Jane entered her contact's country, city, and area, but NOT his contact information. She will keep Mark Smith’s contact information in her own personal files. Note that throughout this process, Mark Smith’s contact information has not been entered in any database (other than Jane's personal one). This ensures that, if Mark is working in a security-sensitive context, his privacy would be maintained as Jane follows the normal protocol that she uses to contact him.